Audi Anchorage in Anchorage, AK treats the needs of each individual customer with paramount concern. We know that you have high expectations, and as a car dealer we enjoy the challenge of meeting and exceeding those standards each and every time. Allow us to demonstrate our commitment to excellence! Our experienced sales staff is eager to share its knowledge and enthusiasm with you. We encourage you to browse our online inventory, schedule a test drive and investigate financing options. You can also request more information about a vehicle using our online form or by calling (855) 606-1607. Welcome to Audi Anchorage, your premier Alaska Audi dealership! We are a family-owned and operated business and for over 80 years have maintained our core values of excellence in customer service, community outreach, and selling quality new, used, and certified vehicles. We are proud to call Anchorage our home and consider you, our customer, as part of our family. And like any great family, we want to provide you with nothing but the very best Audi vehicles. German engineered and gorgeous inside and out, Audi vehicles are known for quality and luxury while maintaining an every-man attitude of humility and grace. Innovative, extremely well made, and lavishly equipped, the Audi is a luxury you'll feel honored to call your own. 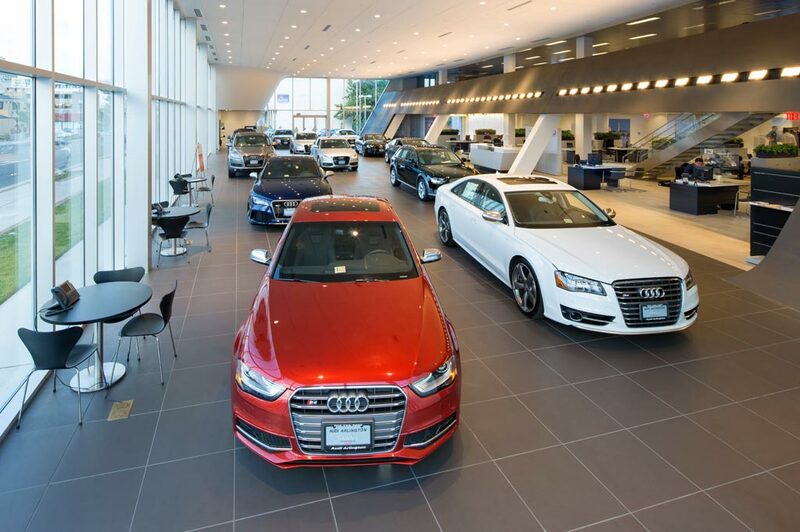 Come see for yourself at our Audi dealership, conveniently located at 6115 Old Seward Hwy in Anchorage, Alaska 99518. We are just a short drive away from the areas of Wasilla, Palmer, and Eagle River. While you're here, get behind the wheel of the new Audi A4, Audi Q3, S5 Sportback, or Audi Q5. Gorgeous from every angle, you're going to fall in love with these new offerings from Audi. You can begin your search for the car of your dreams today by browsing our new Audi inventory and our line up of used cars in Anchorage. Not sure which Audi car is right for you? No problem! The next time you pay a visit to our Audi dealership, our friendly staff will sit down with and help you find a vehicle that fits your unique lifestyle. At Audi Anchorage, our knowledgeable and friendly team of qualified professionals will be here to assist you throughout your vehicle purchasing process and beyond. You can reach us by phone or contact us online and, of course, you are always welcome at our Anchorage Audi dealership. We will help you find the perfect finance option to meet your budget and lifestyle in our Audi Finance Center. You can apply for an auto loan and get pre-approval right from the comfort of your own home. We also buy used vehicles, so go ahead and find out the value of your current vehicle using our convenient trade-in value form, then bring us your current vehicle and prepare to receive the fair trade-in value you deserve. It's a hassle free, stress free process that simplifies getting out of the old and into the car your heart desires. What could be better than that? Audi Anchorage believes in being there for our customers for the lifetime of their vehicles and one way we put that belief into action is through our Kendall Auto Protection plan. This comprehensive coverage is available on all qualified used vehicles and covers everything from roadside assistance to your drivetrain, engine, and transmission. That's a pretty big deal when you consider the kind of weather we consistently encounter here in Alaska. Read more about this amazing coverage online and be sure to ask a Kendall representative for more information. We have faith in the vehicles we sell here at Audi, and we realize what an important purchase this is to our customers. That's why we welcome you back at any time for all of your regular maintenance and car repair needs in our state-of-the-art Audi Service Center. Simply give us a call or contact us online and we'll get you an appointment with one of our qualified mechanics. We also provide certified Audi parts and accessories at our Audi Parts Center. Audi Anchorage knows how lucky we are to sell beautiful Audi cars in the beautiful state of Alaska. We're honored to call Anchorage home and to have you as our customer and neighbor. It's a wonderful life and you deserve nothing but the very best to navigate through yours. So come see us at Audi Anchorage, where quality is second nature to us and where we'll provide you with nothing less.